Epic pagan Viking black metal band Forgotten Land from Cantù, Como of Italy is back five years after their debut album. Formed back in 2006 by Nordic Valkyrja, the band released its first demo “Ancient Tales from Forgotten Lands” in the beginning of 2008. Next year the band self-released its debut full-length album “In Regno Langobardorum“, a very decent work of epic pagan black metal with few folk elements. In 2012, their founding member and front-woman Nordic Valkyrja left the band. The remaining members decided to continue as a four-piece band and started working on the second album. Finally on November 2014 their new full-length album “Omnia Fert Aetas” was out, once again self-released. Forgotten Land practically continue to play on the same style with their previous work, there are though some differences too. First of all the sound is much more natural, technical and clean, with a very good and solid production. Their music has now a more aggressive mood and their guitars sound more powerful and dominant than ever. I think there are no synths at all (at least I don’t listen to them), something unusual for the genre. Don’t expect any catchy epic choral refrains in this one; the band offers straight-forward epic black metal, with melodies based totally on the inspired guitar riffs. Their compositions move in mid to fast tempo rhythms and the overall “speed” of the album is somehow faster compared to the previous album. There are still some slower passages and some acoustic guitars that help the band keep a better balance in its sound. Trescer’s vocals are epic expressive black metal screams, completing the album’s heavy sound, while there are also a few nice epic clean vocals in a couple of songs. Some compositions have folk touches, others sound more epic and some others have a darker pagan black metal mood. “Omnia Fert Aetas” includes 9 songs totally, with a duration over 53 minutes. The first 5 tracks are written in Italian and old Italian (Canturium), dealing with the band members’ city and land, while the remaining 4 songs are in English, dealing with Viking themes. Despite this clear separation of the album’s concept, the music isn’t affected that much, so the whole work has a common solid atmosphere. I was very pleased to find out that Forgotten Land are still alive and thankfully their new work proves they are in a very good shape, despite the departure of their founding member. 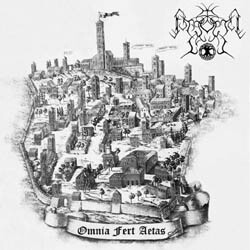 I recommend “Omnia Fert Aetas” to fans of epic pagan black metal, especially to those who prefer the more guitar-based efforts of the genre. The band displays a mature, professional and powerful sound and I hope they continue this way in the future. The album is self-released in a standard jewel-case CD edition, including a 4-page booklet with a very nice cover artwork, limited to 100 hand-numbered copies. It is also available in digital format in their official Bandcamp page and you can listen to it following the links below.